Healthcare must mitigate patient risk factors outside of the hospital, referred to as social determinants of health (SDOH). If healthcare hopes to move the needle on runaway expenses and improve the health of its communities, it must first focus on patients’ social and environmental circumstances, also known as social determinants of health (SDOH). That’s the advice of Cindy Buckels, director of population health for TAV Health, which helps healthcare organizations navigate the challenges of SDOHs. “When we don’t address these issues as we’re addressing someone’s health, we get high readmissions, negative outcomes and dissatisfaction. There’s also increased cost and increased risk,” noted Ms. Buckels during Social Determinants of Health: Using Empathy Interviewing To Help Care Teams Understand Factors Impacting Patient Health, a September 2017 webinar now available for rebroadcast. To encourage individuals to open up about economic, educational, nutritional, or community deficits they face that drive 60 percent of their health outcomes, TAV Health recommends care teams employ empathy interviewing, also known as motivational interviewing (MI). “With motivational interviewing, you’re entering into a relationship with a person, not as the expert, but as a partner coming alongside to help them find their own strengths, and affirming them as a person in order to affect positive change,” said Ms. Buckels. Her presentation included a review of the four core skills of motivational interviewing (“Listen for that positive nugget,” she urges), as well as ‘back pocket’ questions to ask when the conversation stalls. It may take time to master, but ultimately, motivational interviewing is more effective than healthcare’s typical “Chunk-Check-Change” education approach in transforming patient ambivalence and effecting positive behavior change, she said. Information gleaned from motivational interviewing, even minor details like a patient’s nickname or the presence of a cherished pet, should become part of the patient’s record so that every person along the care continuum who ‘touches’ that patient can access it. In closing, Ms. Buckels outlined a patient-centric workflow connecting all supportive organizations, healthcare providers, community organizations and family and friends within the patient’s circle of care, which places more eyes and ears on the individual. With communal oversight to report anything worrisome, the likelihood is much less that a socially supported patient will visit the ER or be admitted to the hospital. 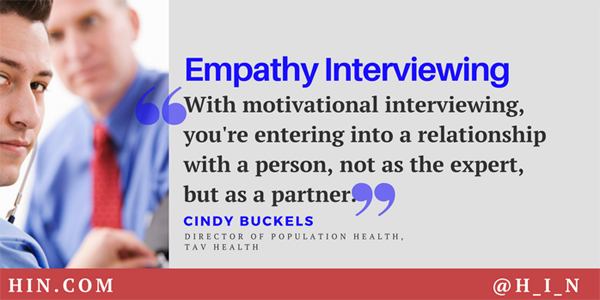 Listen to Cindy Buckels explain the advantages of motivational interviewing over the “Chunk-Check-Change” educational approach. Emergency management services (EMS) can fill gaps in the care continuum with 24/7 medical resources that improve the patient care experience, improve population health, and reduces costs, according to the National Association of Emergency Medical Technicians (NAEMT). EMS is uniquely positioned to support healthcare transformation by assessing and navigating patients to the right care, in the right place, at the right time. NAEMT created an infographic to explain the EMS role in healthcare transformation and how EMS can expand its services to fulfill this new role. Yale New Haven Health System (YNHHS) takes an on-site, embedded face-to-face approach to coordinating care for its highest-risk, highest-cost patients—whether identified within its own employee population, inside a patient-centered medical home (PCMH), or among the geriatric homebound. The Connecticut-based health system believes this vision of care management is the most direct path to success in a value-based healthcare industry. 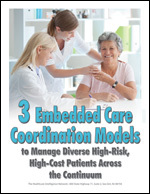 In 3 Embedded Care Coordination Models to Manage Diverse High-Risk, High-Cost Patients across the Continuum examines YNHHS’s three models of embedded care coordination that deliver value while managing care across time, across people, and across the entire continuum of care. 2014's HINtelligence Reports captured trends in healthcare delivery, technology and utilization management. Each year, the Healthcare Intelligence Network’s series of HINtelligence Reports pinpoint trends shaping the industry, from cutting-edge care collaborations to remote patient management connections to tactics to reduce avoidable utilization. HINtelligence Report benchmarks are derived from data provided by more than one thousand healthcare companies. Here are 10 highlights from 2014 HINtelligence Reports that support Triple Aim goals of improving population health and the patient experience while reducing the per capita cost of healthcare. Share your reactions with us on Twitter @H_I_N. Readmissions: More than half of survey respondents participate in post-acute partnerships, with home health collaborations the most common (79 percent). These partnerships serve to streamline processes and care transitions, educate and align staff, and implement changes of value to patients, said respondents to the fourth annual Reducing Hospital Readmissions Survey. Palliative Care: While the majority of respondents (68 percent) administer palliative care on an inpatient basis, more than half (54 percent) say care is conducted on home visits and just under a third offer palliative care at extended care facilities. Patient-Centered Medical Home: Prepared to take their medical homes to the next level of care in the year to come, almost half48 percenthave joined or expect to join a medical home neighborhood, defined by TransformMed℠ as “a strong foundation of transformed primary care practices aligned with health systems and specialists to insure that care is maximally coordinated and managed. Remote Patient Monitoring: More than half of 2014 respondents54 percenthave instituted remote monitoring programs, the survey found, which was most often employed for patients or health plan members with multiple chronic conditions (83 percent). Other targets of a remote monitoring strategy included frequent utilizers of hospitals and ERs (62 percent) and the recently discharged (52 percent). Telephonic Case Management: More than 84 percent of respondents utilize telephonic case managers. One-fifth of telephonic case managers work within the office of a primary care practice. Population Health Management: The last two years reflects a dramatic surge in the use of data analytics tools barely on population health management’s radar in 2012: the use of health risk assessments (HRAs), registries and biometric screenings more than tripled in the last 24 months, while electronic health record (EHR) applications for population health increased five-fold for the same period. Emergency Room Utilization: Among populations generating the majority of avoidable ED visits, dual eligibles jumped nearly 10 percent in the last four years, from 2 to 11 percent, while other populationshigh utilizers, Medicare and Medicaidremained roughly the same. Chronic disease replaced pain management as the most frequently presented problem in the ER, at 54 percent. Stratification of High-Risk, High-Cost Patients: The LACE readmission risk tool (Length of stay, Acute admission, Charleston Comorbidity score, ED visits) is considered the primary indice and screen to assess health risk, according to 33 percent of respondents. Embedded Case Management: Fifty-seven percent of respondents embed or co-locate case managers in primary care practices, where their chief duties are care and transition management, reducing hospital readmissions and patient education and coaching. 2015 Healthcare Forecast: Almost 92 percent of 2015 respondents said the impact of value-based healthcare on their business has been positive, with more than one quarter identifying healthcare’s value-based shift as the trend most likely to impact them in the year to come. Make your healthcare voice count in 2015 by answering 10 Questions on Chronic Care Management by January 31, 2015. You’ll receive a complimentary HINtelligence Report summarizing survey results. Patient-centered medical homes (PCMHs) are not about pigeon-holing certain diseases or illnesses, says Terry McGeeney, MD, MBA, director at BDC Advisors, but about delivering acute and chronic care prevention and wellness. Dr. McGeeney reiterated the five essential features of the medical home as the groundwork for a medical neighborhood. Given many of the initiatives of the Centers for Medicare and Medicaid Services (CMS), coupled with the Triple Aim, many have gotten bogged down and probably overly focused on the name: patient-centered medical home (PCMH). What’s important are the features or attributes of the PCMH: first, its patient-centeredness, a partnership among practitioners, patients and their families that ensures and respects the decisions of the patients and ensures patients have the education and support they need. Secondly, in a PCMH, the care needs to be comprehensive. It’s a team of care providers who are wholly accountable for a patient’s physical and mental healthcare needs, including prevention and wellness, acute care, and chronic care. Third, you will hear discussions about the PCMH being about a certain disease or illness. Please note that it’s acute and chronic care prevention and wellness. Pigeon-holing conditions, while important, is more of a chronic quality improvement initiative and not PCMH. Fourth, under the PCMH, care needs to be coordinated. Care is organized across all elements of the broader healthcare system, including specialists, hospital, home healthcare, community service and support. There’s a lot of debate now about what we call ‘post-acute care’ or ‘transitions in care.’ Jonathan Blum, principal deputy administrator of CMS, recently spoke on the importance of post-acute care. This is what coordinated care particularly is all about. Care has to be accessible. Patients are able to access services with shorter waiting times, after-hours care with access to EHRs, etc., and there has to be a commitment to quality and safety. Clinicians and staff need to enhance quality improvement with the use of health IT and other tools that are available to them. We also need to be very careful that quality care is not equated with lower cost of care. Sometimes those two have a tendency to get muddled. Blueprint for a Medical Neighborhood: Building Care Coordination Between Specialists and PCPs provides a framework in which to evaluate the patient-centered medical neighborhood (PCM-N) model. Pictured here is Terry McGeeney, MD, MBA, director of BDC Advisors, who navigates the landscape of the medical neighborhood, from the value-based payment realities of healthcare today to identifying and engaging specialists in a medical home neighborhood. With the help of care compacts that drive accountability between primary care physicians and specialists, WellPoint has launched a medical neighborhood pilot for three specialties with clear care coordination alignment opportunities with primary care medical homes. Here, Robert Krebbs, director of payment innovation at WellPoint, Inc., discusses how Wellpoint supports the care compact model with Referral Preparedness Tools add-ons devised for physician/specialist patient handoffs. One thing we found interesting was the uniform request from physicians for what we call ‘Referral Preparedness Tools.’ That’s a name we made up. These are add-ons to care compacts that call out common conditions for a given specialty, the conditions for which they often get referrals or consult requests from PCPs. It specifies for that condition what the specialist would like to see for the initial consult or regular repeating referral, and what they want the PCP to do first and send to them and specifically, what they want the PCP not to dothat is, things to avoid before sending the patient over. On the flip side, the tool lists for that condition what the specialist intends to send back to the PCP. The practice will work on this together for common conditions. The tool doesn’t list everything that could possibly happen, but rather specifies the patient flow for common conditions. We didn’t initially include this tool in our care compact expectations. The practices asked us for this; they see this as a true opportunity to drive improvement and efficiency in the system, to avoid unneeded care and to make sure that the correct care is provided for all patients. We’re going to monitor development of these tools throughout the pilot to determine common themes so we can provide a good template starting place on this run as well as for future pilot practices in this program. We’re excited that specialists have made this template their own. They’re hard at work identifying what they’d like to see in these scenarios. Robert Krebbs is the director of payment innovation at WellPoint where he has accountability for the design, development and rollout of value-based payment initiatives. He works directly with network physicians and facilities on innovative performance measurement programs aimed at delivering healthcare value by promoting high quality, affordable care. Doctors don't always know when their patients are in the hospital. Providers in a physician practice are a good starting point for case managers to identify high-risk or high-cost patients for case management, explains Annette Watson, RN-BC, CCM, MBA, senior VP of community transformation for Taconic Professional Resources (TPR). The process of identifying high-risk, high-cost patients can be formal or informal. You can use internal sources; when TPR goes in, that is one of the baselines of understanding. We understand who the patients are and what the population is, because if they have not been using data or have not been in an Advanced Primary Care initiative, it is highly unlikely the practice will have a quantitative method in place when we arrive. We begin by asking the practice providers who the sickest patients are. Second, we can use data available at the practice level, such as registries or reports that can be run from the EHR. Third, we also look at the kind of data they get from external sources. For example, do they receive reports from payors that show some utilization activity? Many of those reports may be somewhat aged. They are not necessarily timely, which raises actionability questions. However, we found there are reports coming out from payors, particularly about recent ER use or hospital discharges, that are more timely, which allow the practices to look at datastill retrospectively in most cases but much more quickly than they were able to in the past. And finally, hospital admission and discharge information is important. Depending on the model in a PCP, if a physician is not the admitting physician that is, if the admission is from a specialist, hospitalist, or through the ERit cannot be assumed the PCP has the admission and discharge information. People may think physicians know about their patients being in the hospital, but that is not always the case. Having established a firm foundation over two decades of patient-centered care, the patient-centered medical home (PCMH) model is poised for renovation, expanding into medical neighborhoods and opening the door to specialists’ enhanced role in care coordination, according to a new infographic from the Healthcare Intelligence Network. This HINfographic presents 10 metrics documented by HIN’s seventh PCMH survey in March 2014, including the rise in medical homes, involvement of remote care management and case management, biggest challenges, future outlooks and more. 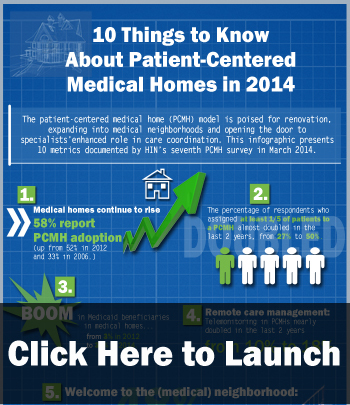 Want to know more about patient-centered medical homes? 2014 Healthcare Benchmarks: The Patient-Centered Medical Home, a 40-page report now in its seventh year, is designed to meet business and planning needs of physician practices, clinics, health plans, managed care organizations, hospitals and others by providing critical benchmarks in medical home implementation and results.